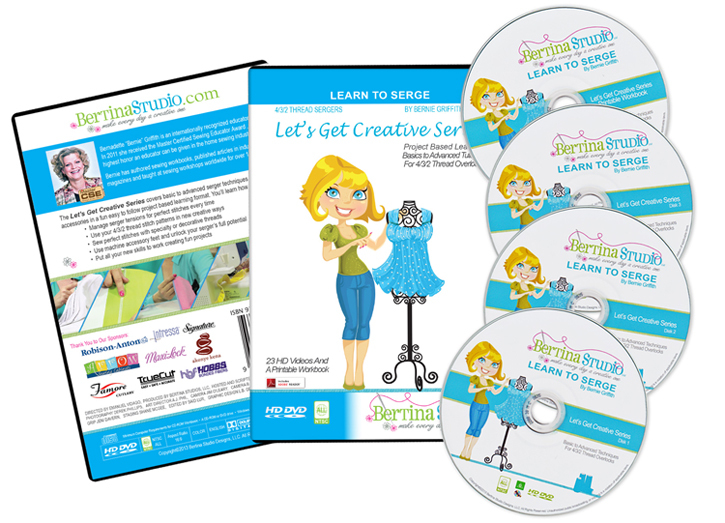 Bertina Studio's Let's Get Ready Series - Learn to Serge is a project based learning program and covers basic to advanced tutorials, for 4/3/2 thread overlock sergers. This 4 thread serger instructional DVD features the Brother 5234PRW serger and accessory feet. Hosted by Bernadette "Bernie" Griffith, who is a featured teacher at events throughout the United States and Australia. Bernie’s projects have been featured in numerous sewing and quilting magazines. Her machine workbooks have been distributed worldwide for over 10 years. In 2011 Bernie received the highest honor an educator can be awarded in the sewing industry. She was presented with the Master Certified Sewing Educator Award at the 2011 Sewing Dealer’s Trade Association annual convention. Bernie’s relaxed teaching style, creative approach to sewing and love of machine embellishment, make her classes both informative and fun. There are Appx. 103 minutes of video over 3 DVD's and a 1 CD with a printable workbook 105 pages. Disc 4 Printable Workbook pdf CD 105 pages.